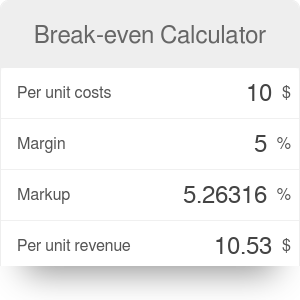 Break-even calculator allows you to perform a crucial task in the beginning of your business endeavor. The goal of break-even analysis is to let you know how many units of goods you need to sell in order to cover all costs (cost of goods sold and other, fixed costs that are not tied to the quantity of inventory). Go ahead and use the calculator, it's fairly straightforward. If you'd rather calculate it manually, see below how to calculate break-even point and what's the break-even point formula. Find out how much you make on every unit. For example, if you buy for $30 and sell for $45, your gross profit per item is $15 (let's assume you don't have other per-unit costs). Divide your fixed costs by the profit you make on every unit - $2700 / $15 = 180 - this is how many units you need to sell. The overall sales figure is easy: 180 * $45 = $8100. The manual break-even analysis is super easy once you realize that you simply need to balance fixed costs with gross profit. Let me walk you through the whole process. Depending on your needs, you may provide profit margin or markup to calculate your revenue... or even the other way around - to calculate the price yo may pay for goods, given all the other numbers. Break-even Calculator can be embedded on your website to enrich the content you wrote and make it easier for your visitors to understand your message.